You know those flavors that just stick with you from your childhood? There are certain dishes that just hit me as the ultimate in flavor and comfort food. My mom’s broiled pork chops are one of them, and it’s the sage in the dredge that just gets me. I haven’t attempted this recipe in a LONG time because it calls for cornmeal and flour. 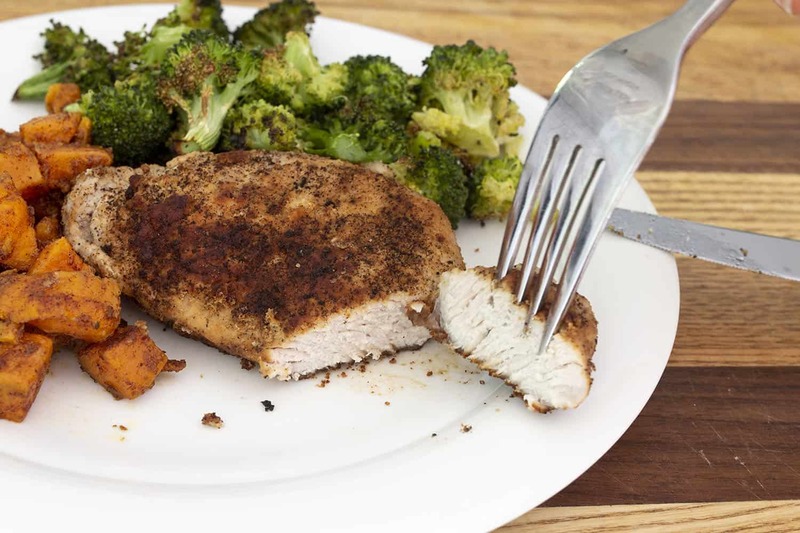 Well, I put my big girl pants on and figured out how to make this breaded pork chop AIP and Paleo friendly. These revamped pan-fried sage pork chops turned out fantastic! The original recipe called for a dredge mixture of spices, cornmeal, and flour. I couldn’t think of an ingredient that would create the texture of cornmeal, but using coconut flour in place of wheat flour worked just fine. 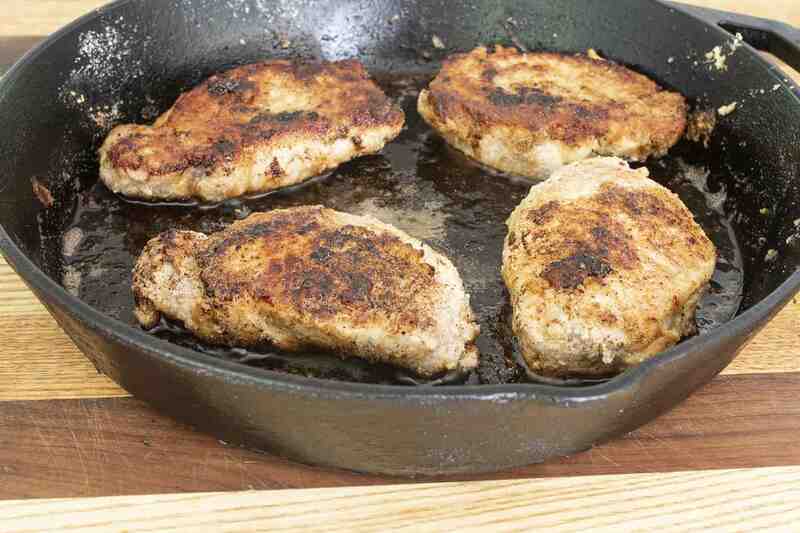 Fry the pork chops in a hot pan with melted coconut oil. The meat does not need to be submerged in oil. This is not deep frying. I put about 1/2 cup of coconut oil in the pan, and it worked just fine. Only turn the pork chops once so that beautiful crust has time to form. To complete this meal, add a starchy and low-starch vegetable. I chose roasted broccoli and sweet potatoes (my go to). Enjoy your delicious, healthy meal! What is your favorite recipe from your childhood? Do you have certain flavors that you just love to this day? AIP, Paleo comfort food at its best! Quick to cook and delicious, the whole family will enjoy this entrée! Pour the coconut milk in a shallow bowl. Be sure to shake/stir it first to incorporate the fat back in. 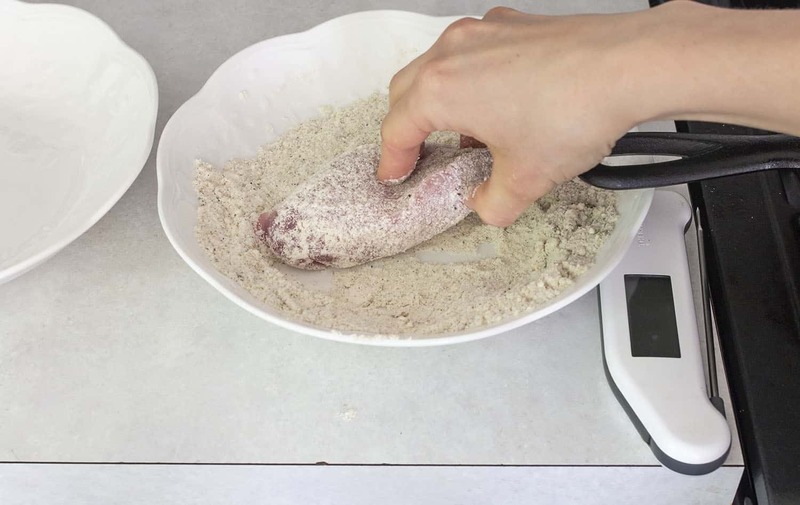 In another shallow bowl, mix the coconut flour, sea salt, sage, onion powder, and black pepper to make the dredge. Heat the coconut oil in a cast iron or heavy bottomed pan over medium-high heat. Dip the pork chop in the coconut milk, on both sides. Then dip in dredge, covering all sides. Place in hot pan. Repeat for the rest of the pork chops. Cook over medium-high heat for 5 minutes then flip over when bottom is browned nicely. Cook for another 5 minutes or until the internal temperature reaches 165°. Do not flip multiple times so that the crust has time to form on the pork chop. This recipe has 3g of carbohydrates per serving. Want to remember this? Save Pan-Fried Sage Pork Chops to your favorite Pinterest board!